The public announcement a couple of months ago by Tesla of a medium sized stationary Lithium-ion battery targeting the household market provoked an inordinate reaction. The web erupted with the Powerwall, from exuberant stockholders to mindless criticism, to Forbes' ridiculous claims, every one had a compulsive need to opine over it. I noted the hype and expressed my scepticism towards a technology that seems far from cutting edge in what stationary applications is concerned. In spite of all the publicity there was little effort to put numbers up for discussion. What is the cost of the electricity generated by a system backed by a Powerwall? This post is an exercise attempting to answer this question. It presents calculations towards the levelised cost of electricity for a household self-consumption PV system, with and without the Powerwall. The usage of a stationary battery by a household is only justified with a self-consumption system. I.e., an arrangement where the electricity generated by the household is consumed in situ and not feed to the grid. This is the context where no feed-in tariff is in place. This profile is just that: typical; power consumption changes considerably throughout the year. This profile can be markedly different from work days to weekends, and obviously, cooling/heating varies substantially with outside temperature. As this exercise will show, the consumption profile has a profound impact on system dimensioning, and ultimately, on the levelised cost of the electricity it generates. But this profile is generic enough for this exercise. It features the quick hike with sun rise, a first peak around noon, a small dip in the afternoon and the major peak in the evening when folk get back home from work. The second step is to develop a generation profile matching this consumption profile. Doing so requires a choice of location to compute solar irradiation. In this exercise the city of Pavia was chosen, convenient for falling right on 45º of latitude and in a zone where civil time is within half an hour of solar time. The r.sun model from the GRASS library was used to calculate the solar irradiation profile in Pavia at the Summer solstice with clear skies. All parameters were left by default, except the Linke factor, hiked to a level of 4, representing the increase in atmospheric turbidity in hot days. An hypothetical self-consumption PV system can not generate more than 300 W at noon in the Summer solstice. Using a radiation to electricity conversion factor of 12% (accounting for the negative impact of heat in Summer) results in a system with 2.5 kW capacity. On the day of the Summer solstice this optimally dimensioned system generates just under 3 kWh in Pavia. This compares to the almost 8 kWh represented by the typical consumption profile. Using present day PV system and installation prices, the Solar Power Cost Calculator (SPCC) produces a levelised cost of 0.066 €/kWh for the electricity generated by an optimally oriented system in Pavia. The parameters used in this calculation are summed up in the table below. Enter the batteries and now the system can be scaled up to generate the full household consumption at the Summer solstice. It is again important to stress that by going above this value results in non consumed (lost) power that will increase the ultimate levelised cost of electricity. Whereas in the previous system the generation profile was adjusted to match consumption at noon, it is now adjusted so that it sums up to 8 kWh. The resulting profile peaks at 820 W by noon, with the excess electricity generated throughout the day stored and consumed at night. One more intermediate step is necessary to assess the storage capacity required by this system. The power that is not immediately consumed is cycled through the batteries with a certain loss, and as the batteries age this loss increases, i.e. the battery loses efficiency. In this exercise a ballpark figure of 90% for battery efficiency is used. The system must be dimensioned up somewhat to account for this loss, the table below sums up these calculations. With the system dimensioned and using again the typical consumption profile, a battery charge profile can be generated. Battery charge peaks just under 3.8 kWh at 17h00. 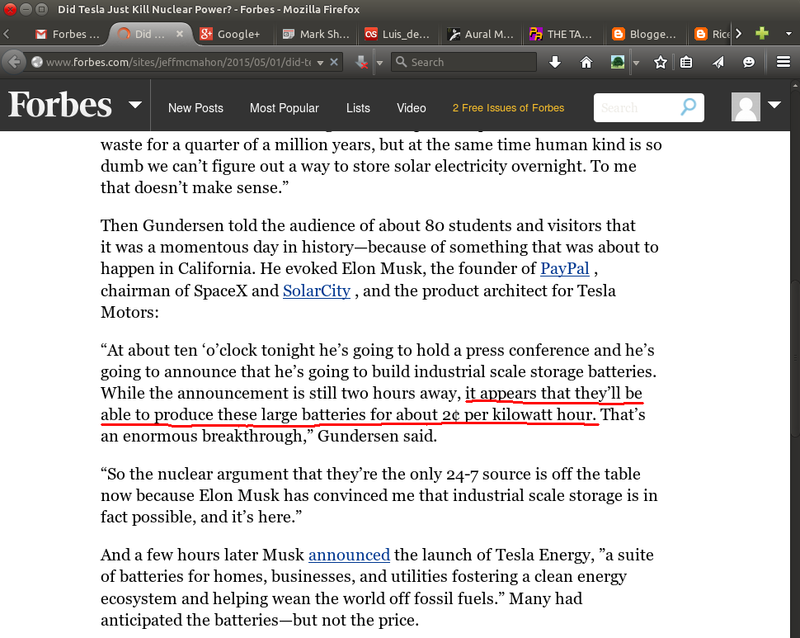 This is about half the capacity of the smallest batteries marketed by Tesla. And finally a new price for the battery backed up system can be calculated. Tesla announces the smallest of its stationary batteries for 3 000 $; adding in VAT and a charge controller this figure climbs up to 3 500 € (note that additional installation costs are ignored). Feeding these figures to the SPCC results in a levelised cost of 0.11 €/kWh. The table below resumes the cost structure added to the basic system. If system capacity increased by 190%, the cost of electricity shot up by two thirds. For the typical household used in this exercise, a solution with a 500 $/kWh battery of 4 kWh capacity is actually cheaper. Before considering the battery itself, it is important to note a very relevant outcome of this exercise, the increase in system capacity once a battery is added is huge - 190%. This fully justifies the employment of batteries in self-consumption systems and highlights in a different way the impact distributed generation can have on the traditional electrical supply and distribution system. Regarding the Powerwall itself, the main conclusion from this exercise is the inadequate capacity for a typical household. It is simply too large, able to store over 80% of all the daily electricity consumption. This over-dimensioning results in a considerably higher cost for the electricity produced by the system - be it PV or other. It can be argued that the end cost for PV plus the Powerwall (0.11 €/kWh) is still well under grid rates, but on the market this battery is not competitive with alternatives that though more expensive in €/kW may scale better to a typical household. The Powerwall may eventually find a niche, with SMEs or with multi-family houses, but is clearly not geared for single-family housing. Note however, that for a system requiring 10 KWh of storage the Powerwall is again in disadvantage in face of a more expensive but modular solution. In this later case two batteries must be acquired, an investment totalling 7 000 €. This is another important conclusion: modularity clearly wins over price. Finally it must be stressed again that these numbers should not be applied at face value when dimensioning a system. Each household is likely to have a different consumption profile (seasonal patterns, construction materials, etc). The household consumption profile must be studied or estimated in the best way possible before a self-consumption electricity system can be dimensioned and installed. At 45º N storage allows a 190% capacity hike for a self-consumption PV system. The Powerwall is largely over-dimensioned for a typical household. The Powerwall hikes the levelised cost of electricity by at least 66%. The Powerwall is likely constrained to a market niche with high consumption profiles (e.g. SMEs). Modular battery designs have the advantage over cheaper, large capacity, designs. System dimensioning is a complex task - each case is a case. de Almeida, A., Fonseca, P., Schlomann, B., & Feilberg, N. (2011). Characterization of the Household Electricity Consumption in the EU, Potential Energy Savings and Specific Policy Recommendations. Energy & Buildings, 43 (8), 1884 – 1894. August.